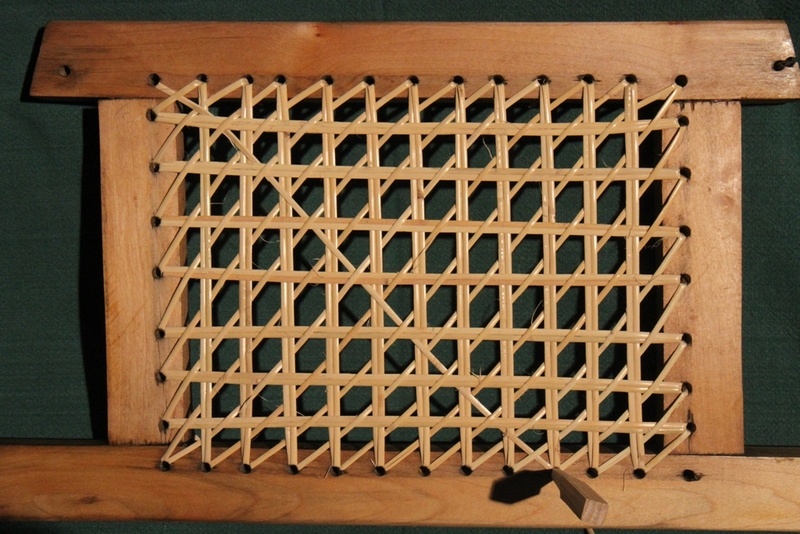 The Peterborough Canoe Company (1879 – 1961) installed hand-woven cane seats in many of their wood-canvas canoes as well as many of their all-wood canoes. 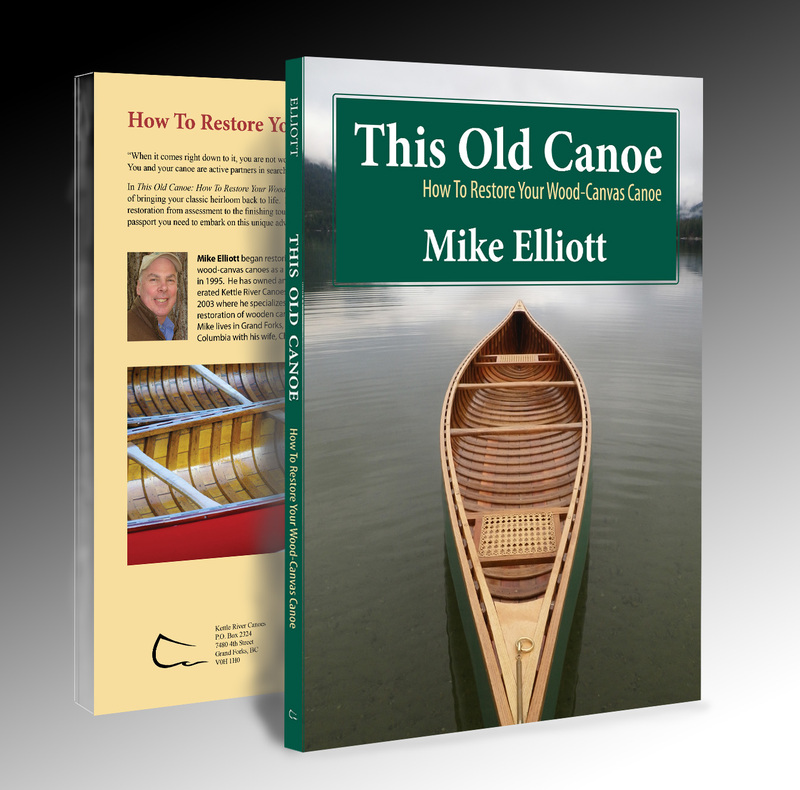 Their pattern is similar to the six-stage “quick” pattern used by the Chestnut Canoe Company (1897 – 1978). Only the sixth stage in the pattern is different. 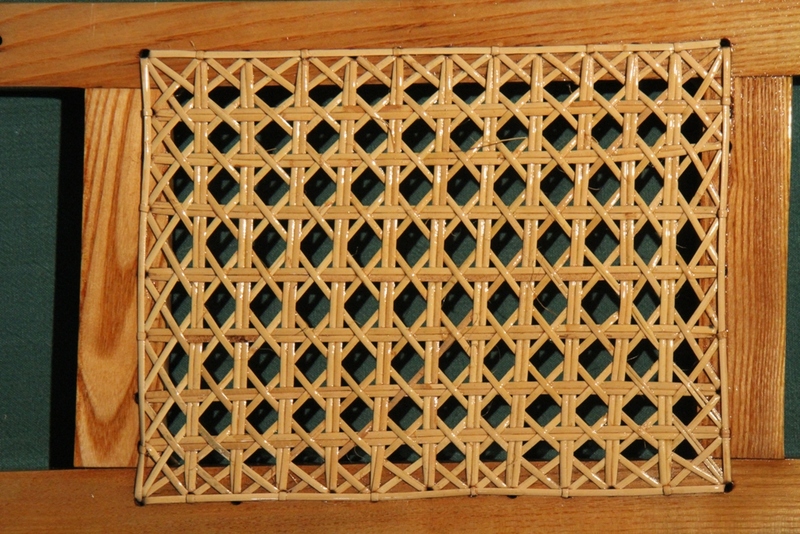 In the Chestnut pattern, both diagonal weaving stages (fifth and sixth stages) weave under the vertical strands and over the horizontal strands. 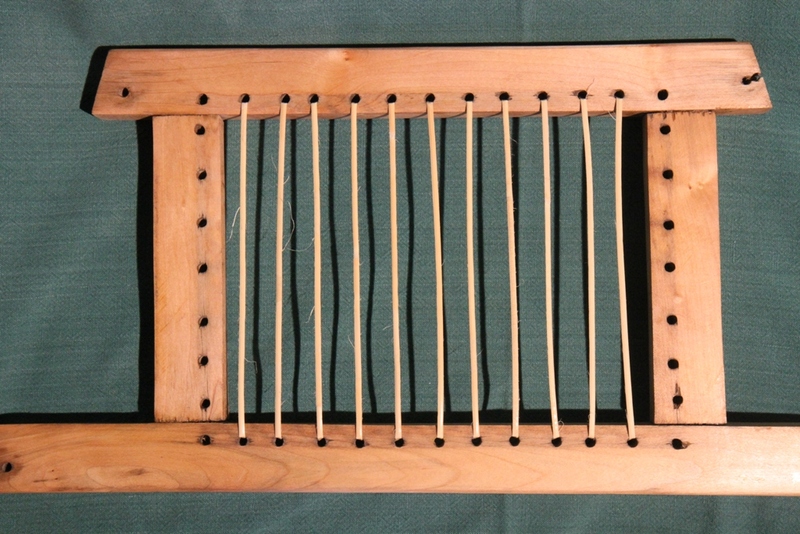 In the Peterborough pattern, the sixth stage weaves over the vertical strands and under the horizontal strands. In my book, I describe the full process of preparing the seat frames, preparing the cane and handling the cane during the weaving process. Here I will present the basic look of each stage and give details for the sixth stage only for the Peterborough pattern. 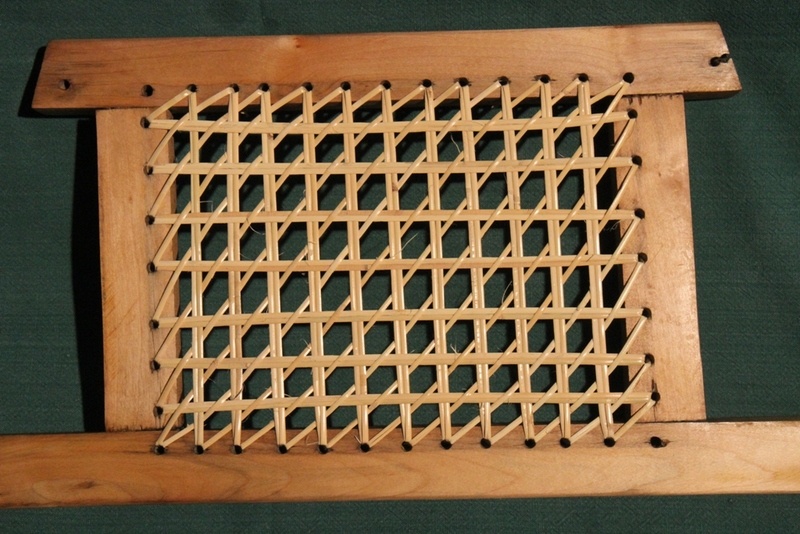 Sixth stage – Begin the pattern in the empty corner on the transverse rail of the seat. 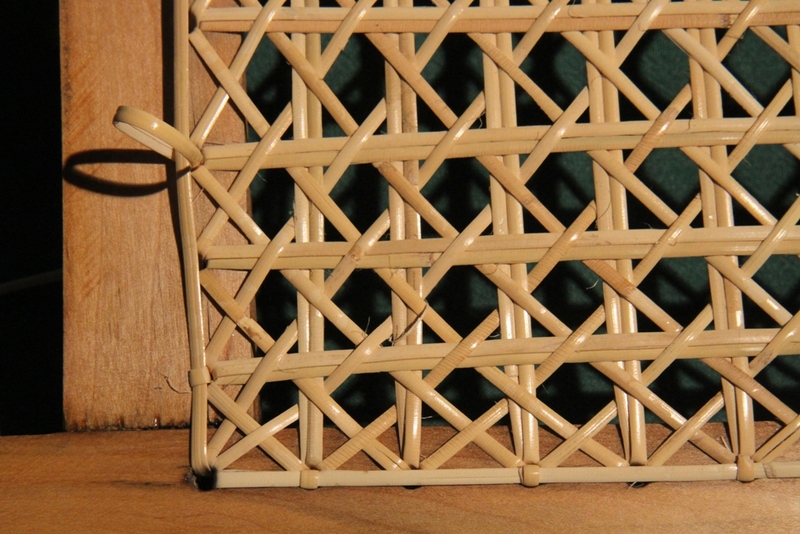 Feed one end of the cane strand through the corner hole from the top-side to the under-side. Secure the strand-end in the usual manner. 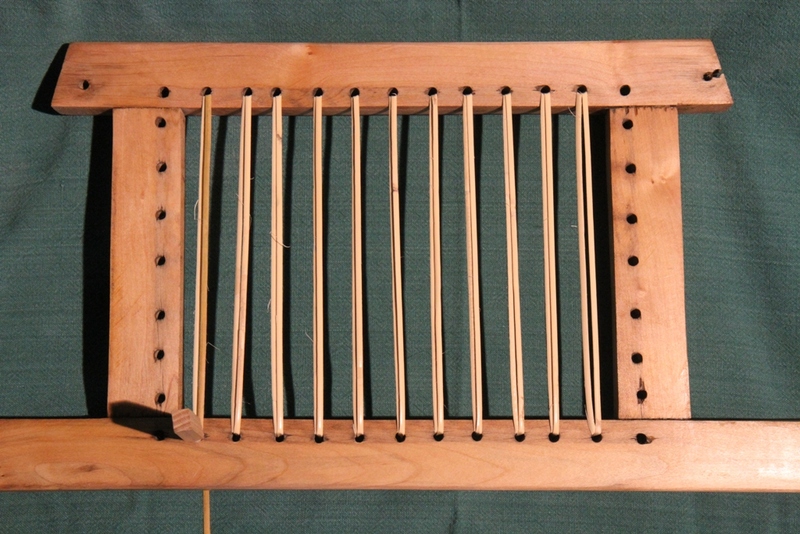 Secure the strand in the corner hole with a caning peg on the top-side. Trim the working-end of the cane strand to create a sharp point. 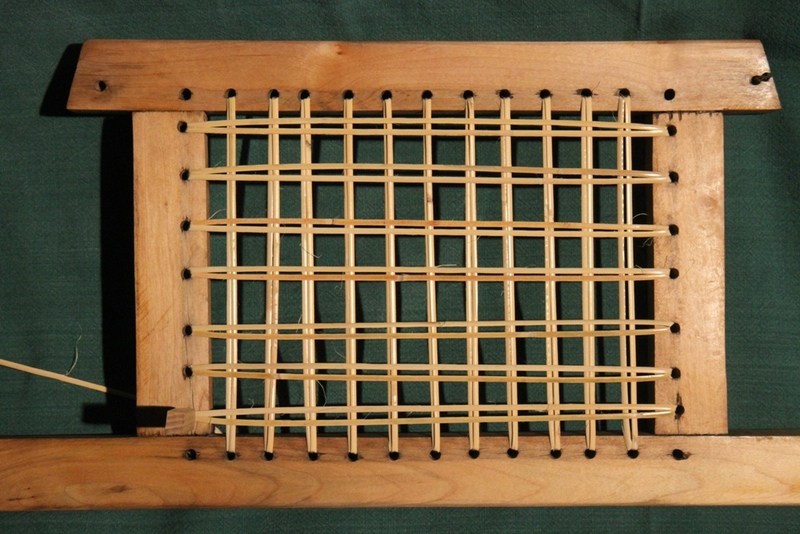 This makes weaving easier. Make sure the shiny side of the strand faces up and is not twisted. 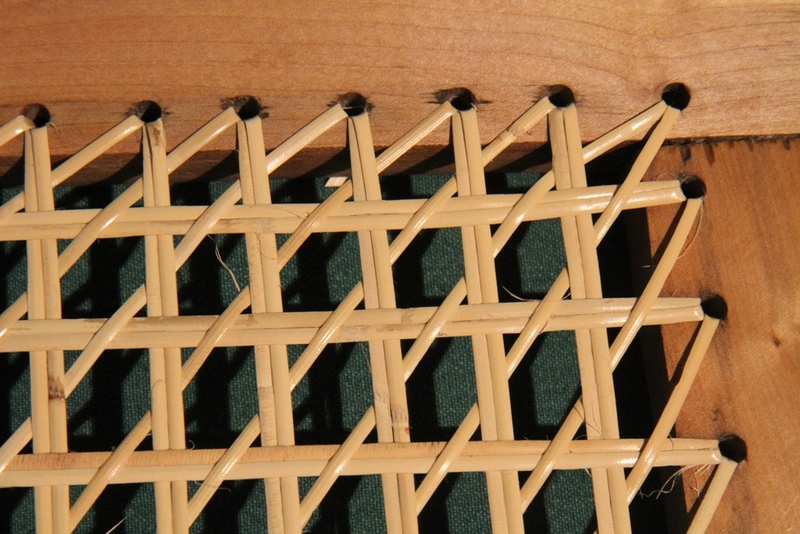 Start the weaving pattern by going under the diagonal strand next to the corner hole on the transverse rail of the seat. Then, weave over the first set of vertical strands in the pattern and under the first horizontal strands. Continue in this way (over the second set of vertical strands and under the second horizontal strands) until you reach the opposite transverse rail. 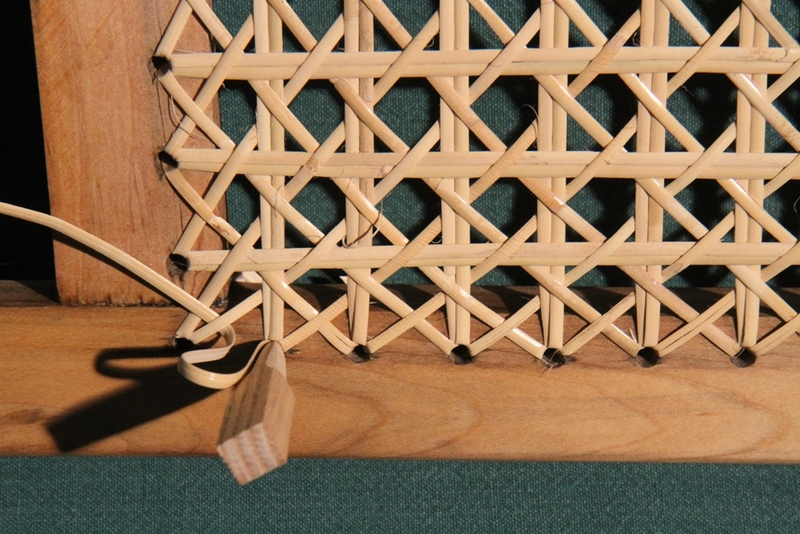 Make sure you weave under the diagonal strand on the transverse rail before threading the strand down through the hole. 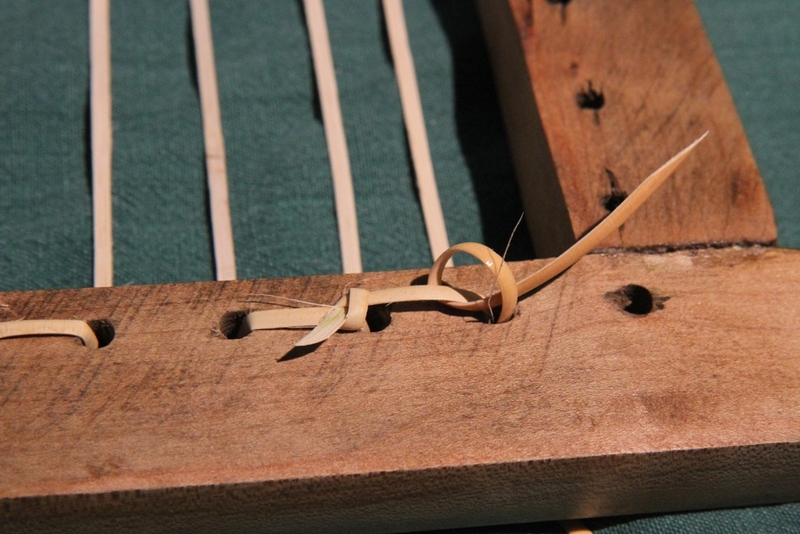 Pull the strand snug (but not tight) and secure the strand with a caning peg. Continue with this pattern for each diagonal strand as you work toward the empty corner in the bottom transverse rail of the seat frame. As usual, the corner hole has two strands since it is both a hole along the transverse rail and the side rail. The strand going into the corner hole as part of the transverse rail strands weaves under the final diagonal strand before entering the hole. 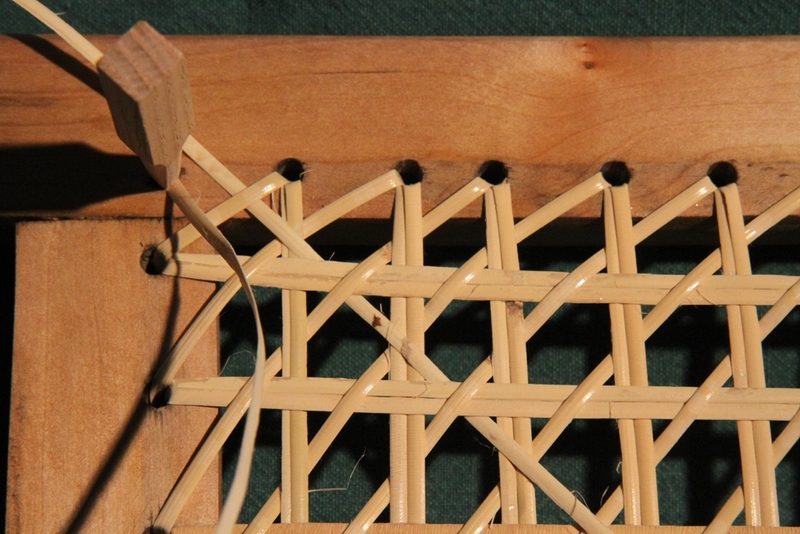 The second strand from the corner hole begins by weaving over the diagonal strand, then under the first set of horizontal strands and over the first set of vertical strands. Continue in the way until you reach the top transverse rail of the seat frame. I rarely weave the Peterborough pattern. Consequently, I have to check and re-check my work constantly. I work slowly and carefully to ensure that my mistakes are made as quickly as possible. 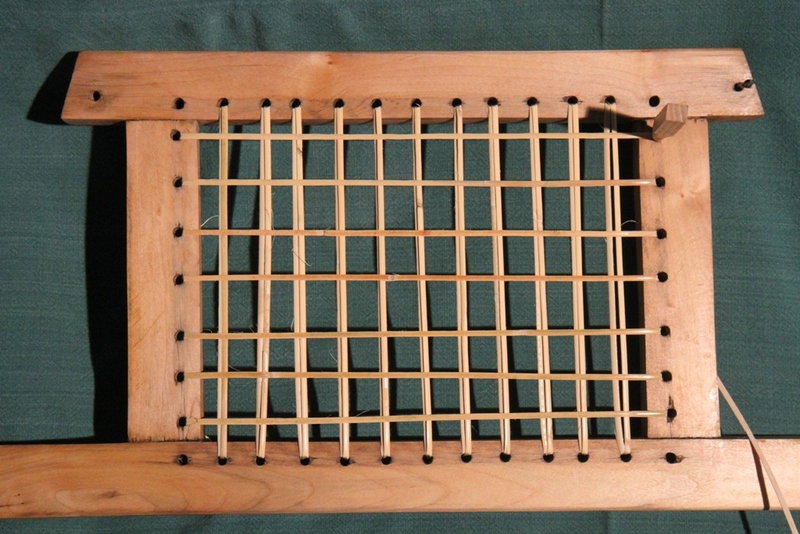 Complete the sixth weaving stage at the corners of the seat. Make sure the strand weaves under the diagonal strand from the transverse rail and over the diagonal strand from the side rail. 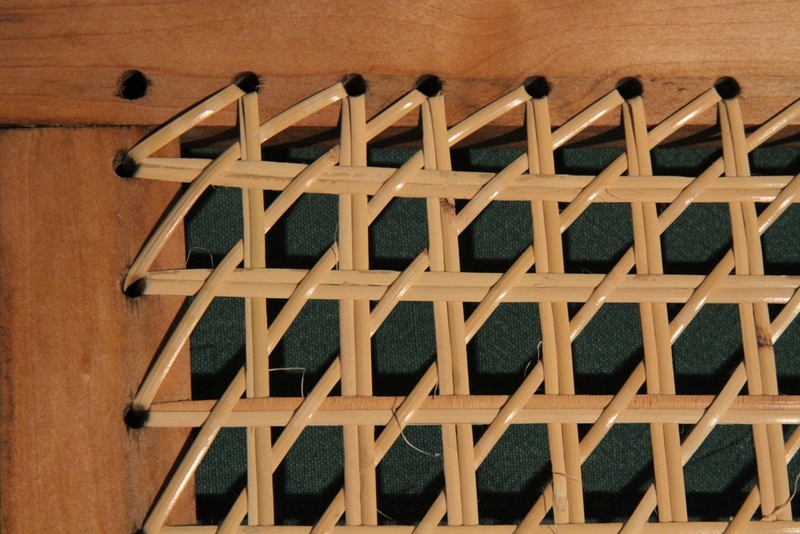 Complete the seat weaving with the usual “couching” to cover the holes in the seat frame. The couching is held in place with loops of cane in every second hole around the seat frame. Hmm, that’s the first time I have ever heard it called the Peterborough pattern. I know it as Double Diamond. 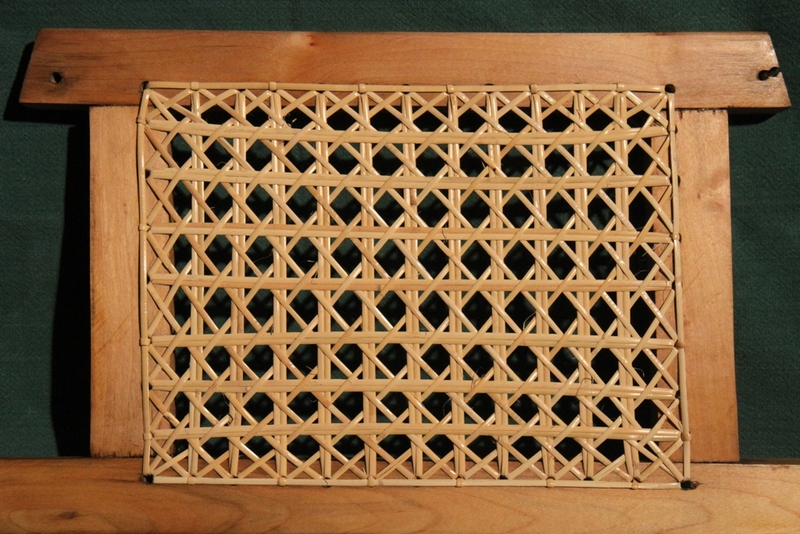 I call it the Peterborough pattern because I first saw it in a Model 44 longitudinal strip Peterborough canoe. 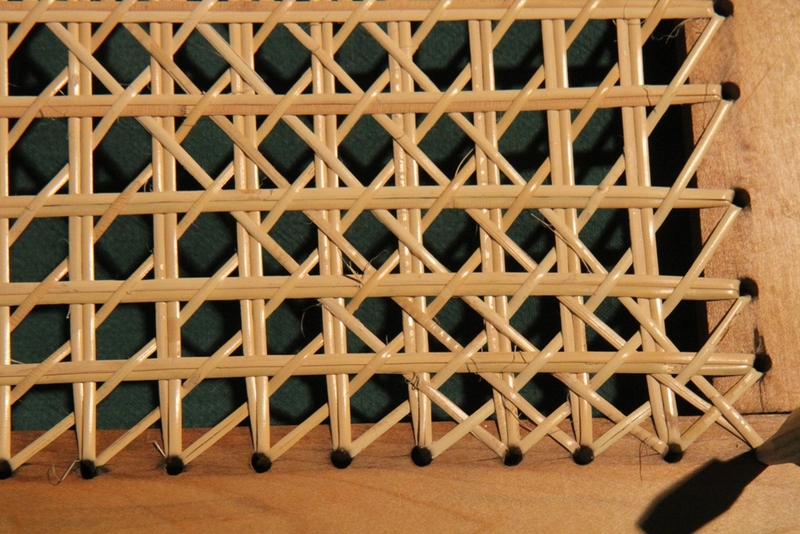 It seems logical to call the pattern used in Chestnut canoes a “Double Diamond” because both diagonal strands are woven over and under double strands using the same pattern — thereby forming diamond shapes. I suppose one could call the pattern used by Peterborough the “Asymmetric Double Diamond”. What say you?